If you went to high school in the early 2000s, chances are you had a lot of interesting layering habits. Tank tops and belts were layered liberally and with abandon, but one of the most notable looks of that decade was the dresses-over-pants combos. 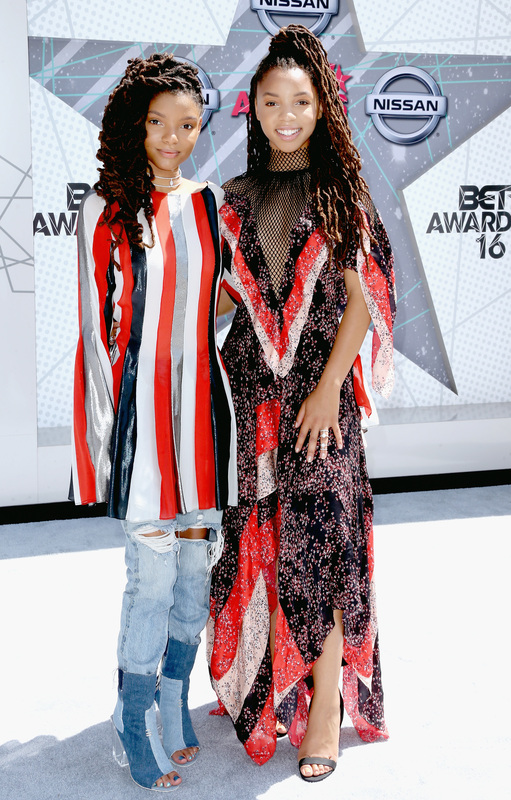 Tonight, Chloe x Halle at the 2016 BET Awards did an early noughties throwback with their dresses, following the bold fashion choices of the early millennium. The duo was originally discovered via YouTube and is now signed to Beyoncé's record label Parkwood Entertainment. They also made an appearance on 2016's Lemonade. Considering they're basically Beyoncé's protégées, it only makes sense that they would slay on the red carpet with bold sartorial choices. So what did they wear to the BETs? In choreographed red, black, and white looks that seemed like a head nod to the twinning looks of Destiny's Child, the sisters showed up in dresses. While Chloe was wearing a flowing maxi with a fierce mesh turtleneck, Halle's bell-sleeved tunic is the one I'm going to concentrate on right now. Following the early 2000s penchant for rocking tunics over leggings, frilly mini skirts over bell bottom jeans, and low-cut dresses over boot-cut pants, this outfit is a total throwback to our teenage layering days. And what makes it even more fabulous (and retro!) is that her boots are also made out of denim, making the jeans all the more prominent. While a busy look like this one might not be to everyone's liking, a kid who grew up during the Y2K fashion era can totally understand the nod to those inventive layering days.